This is a super easy dish even though saying it out loud “Linguine in Vodka Sauce” in a very Italian-like accent makes it sound really fancy. You could easily add some chicken and a side of asparagus to really jazz it up and add color. 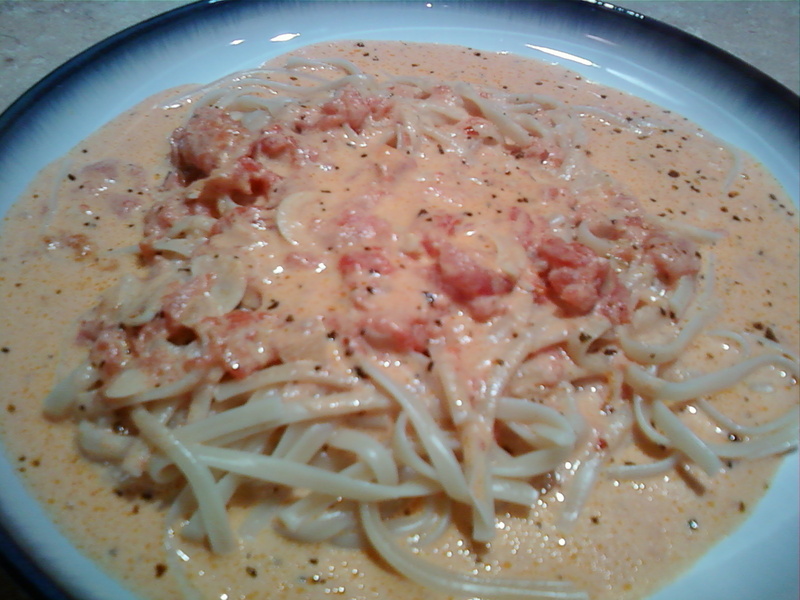 The vodka sauce was really tasty, but way too runny. I cooked it and cooked it trying to thicken and it never did so we just ate it as is. Next time I’ll leave out the water the recipe calls for. Still, it was super easy to make and really tasty! I added a little extra red pepper flake because we like things spicy, but you could certainly do everything exactly the way the recipe asks and it would be very good. You first have to make a marinara sauce. I used a recipe for Perfect Marinara Sauce, which in my humble opinion is nowhere near perfect. So I suggest making your favorite marinara sauce. Mine involves browning some garlic and onions very finely chopped in olive oil then adding a can of tomato sauce (a small one because you only want about 2 cups of sauce), basil, oregano, black pepper and a pinch of brown sugar. If you like chunkier sauce use the Perfect Marinara sauce link above. They call for a can of whole peeled tomatoes. They make it taste really good, but also make it too thin for my liking. My Mom would most likely enjoy the chunkier version. 🙂 Whatever you decide, leave out all the extra goodies like olives, zuchinni, etc. in this sauce. Save those things for spaghetti. After you have made your basic marinara sauce however you like to make it, saute a couple of shallots (or finely dice some sweet onion) in 2 Tbsps of butter. 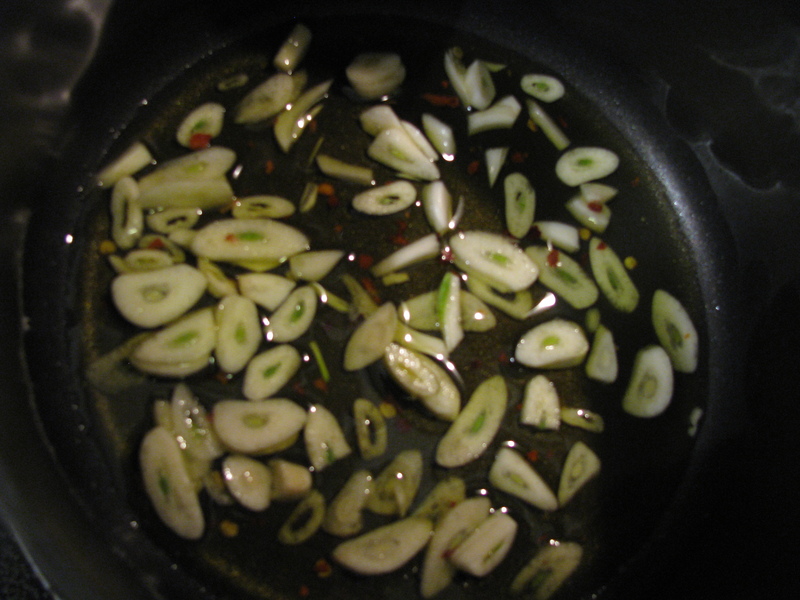 Add the marinara sauce to your shallots or your shallots to your sauce depending on what kinds of pans you use. Then add 3/4 heavy cream to the mixture and heat through. Add a pinch of red pepper flakes and stir in 1/4 cup grated parmesan. Add 1-2 Tbsps of vodka and stir well. That’s it. Told you it was easy. While you have the vodka out… try my drink of the night: Slutty Shirley. I find having a drink or two while cooking makes the experience twice as nice. To make this drink do a shot of vodka (if you have raspberry vodka use that, but regular works fine) in a glass with a few cubes of ice. Fill the glass almost full with Sprite and add a little grenadine for color. Plop in a maraschino cherry and drink. Now for dessert: Decadent Raspberry Brownies. They are so amazing they need their own post so check back later for the word on the brownies. Categories: Baking, Cooking, Delectable Dabbling, Food, Savory | Tags: drink, pasta | Permalink. Anne Burrell scares me. But she also makes really delicious looking pastas on Food Network. As luck would have it we received our monthly Food Network Magazine the other day and she had a recipe for homemade ravioli inside. So I decided to conquer my fear of Anne and pasta and beat those eggs like I mean it. Be aggressive! Even though Anne scares me, I actually really admire her. After making this ravioli my admiration is greater than ever. While not too terribly hard, this dish is very time consuming and physically demanding. Seriously, kneading pasta dough for 10 minutes really takes it out of you! 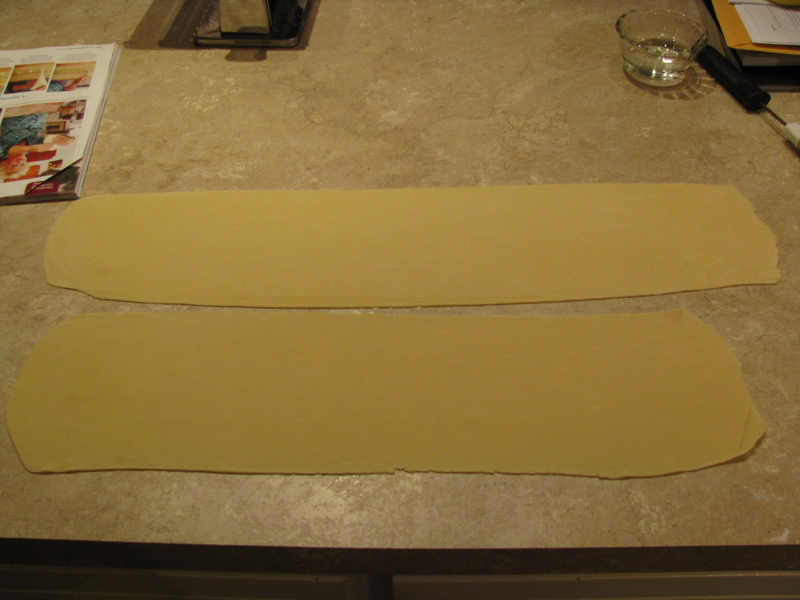 That said, the taste of fresh, homemade pasta is SO worth the work. However, if you have never made this before I’d allow at least 2 hours for the whole meal. The pasta dough has to rest for an hour, and if you are like me you constantly check the recipe to make sure you are doing it right. That eats up a lot of time. Anyway, on to the recipe. Pile the flour on a large cutting board or the counter and make a well in the middle. Put your eggs, oil and salt in the well. Beat the eggs in the well with a fork. Then use the fork to break the flour wall and gradually incorporate the flour into the egg mixture. Here is a youtube video to give you a visual http://www.youtube.com/watch?v=xXr5kQphmJs. After the flour and eggs are mixed, gather the dough into a ball and knead. 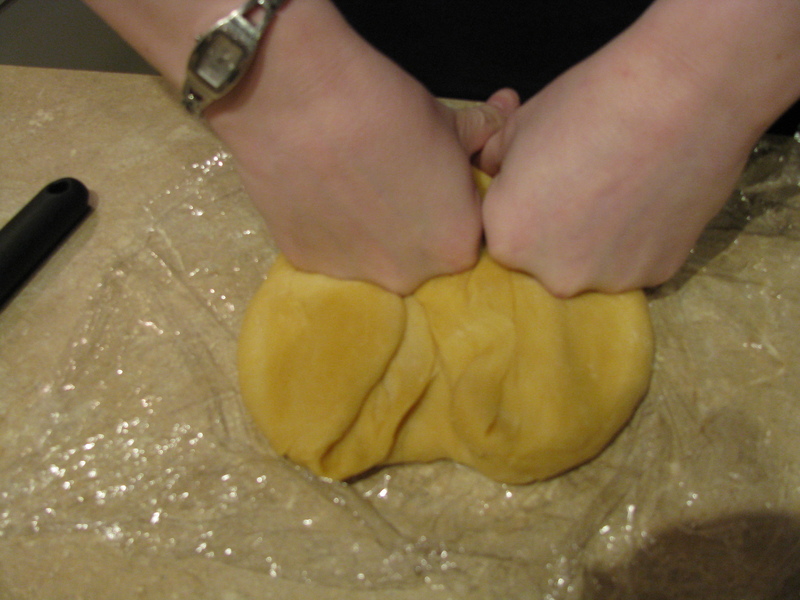 Continue to knead until dough is “smooth and supple”, about 10 minutes. If the dough is too dry (mine was a little dry) get your hands wet and knead the moisture from your hands into the dough. After the dough is kneaded wrap it in plastic wrap and allow to rest at room temperature for at least an hour. While the dough is resting prepare your filling: 1 cup ricotta, 1/2 cup freshly grated parmesan, 2 eggs, 1/4 cup fresh chopped parsley, 1/8 tsp salt. Mix all ingredients in a bowl. Transfer the filling from the bowl into a pastry bag (or a ziploc you don’t mind ruining) and refrigerate. You can also put in some tallegio cheese, but we didn’t have any. Now you have to think about your sauce. I chose to make a marinara because I didn’t have any of the ingredients for Anne’s pancetta mushroom sauce. However, I will be making these again with the pancetta sauce because it looks awesome. The marinara was pretty good. It would have been better with fresh tomatoes, or at least whole canned ones. All I had was tomato puree so that had to work. Here’s how it went: In a large saucepan (big enough to hold your ravioli and sauce) combine 3 Tbsp olive oil, 6 cloves of garlic thinly sliced, and a pinch of red pepper flakes. Cook on medium-low heat until garlic is golden, about 5 minutes. After the garlic is browner than in this picture, add 1 can of tomato puree, 1 can of water, 1 Tbsp basil (or a handful of fresh basil leaves if you have it), 1 tsp salt. Let the sauce simmer for about 20 minutes (it can simmer longer if you need it to, though). 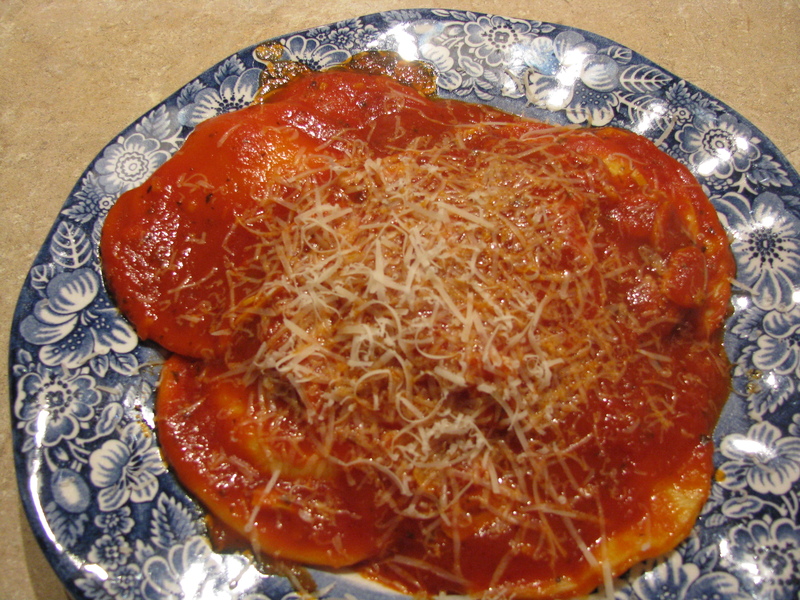 Once your raviolis have boiled you will add them to the sauce before serving. Your dough should be ready by now. Unwrap it and separate it into 3 pieces. 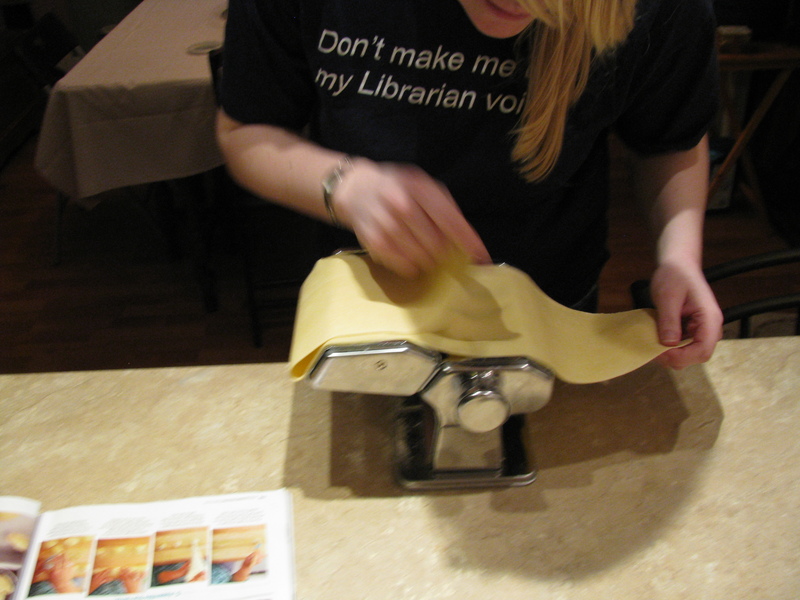 If you have a kitchenaid mixer with a pasta roller attachment you can use it for this. If not you will need a crank pasta roller like mine (you can get one for about $30 at Bed Bath and Beyond and they are super cool!). With your hands, slightly flatten a piece of dough and crank it through the roller on the widest setting. Do this a couple of times. 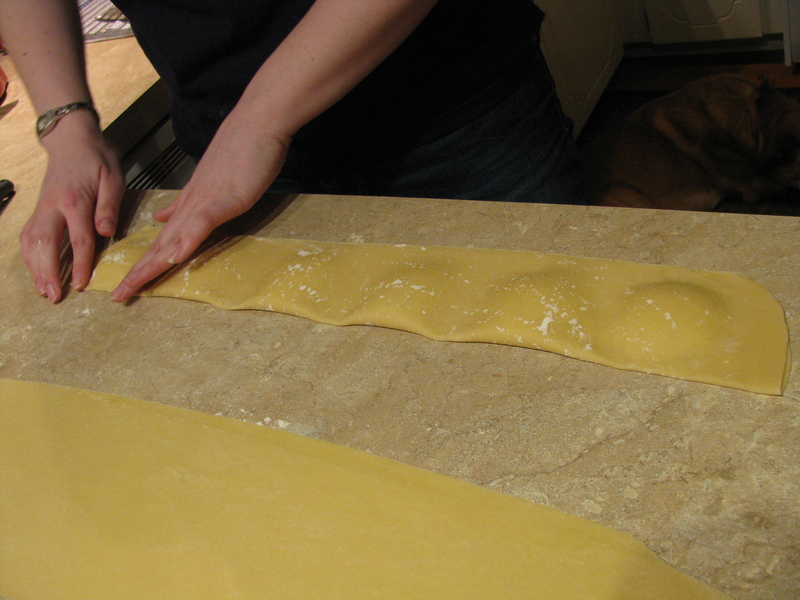 Fold the dough over itself in thirds and feed it through the roller again on the highest setting. Continue to crank the dough through the roller, taking the width setting down one place each time you feed the dough through. When you feed it through on setting 4 on a hand crank roller the dough is done (stop on the second to last setting on a kitchenaid mixer). If your dough gets sticky you can lightly flour it before sending it through again. Your dough should be about 1/16 of an inch thick when finished. Lay the sheets of dough on a lightly floured surface. Very lightly brush the bottom half of the sheet (the half closest to you) with water. See pictures below for visuals for all of this. 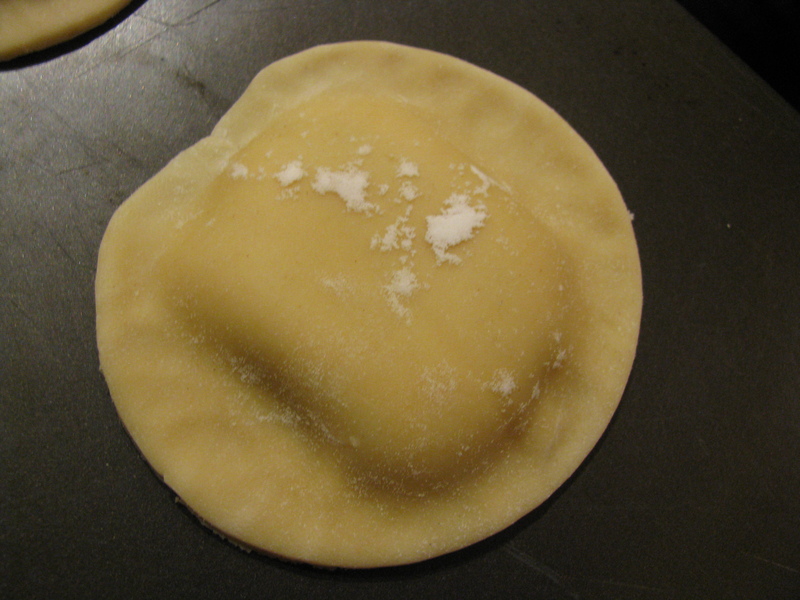 Cut a hole in the corner of your bag of filling and pipe a one inch ball of filling onto your pasta sheets. Pipe the filling on to the damp part of the pasta. Space the filling balls about 2-3 inches from each other. After you have piped all along the sheets of dough, fold the dough over the filling and use your fingers to press the two sides of dough together around the filling. Try not to have any air bubbles in the filling section. This isn’t super easy. I messed up a couple of times and filling came oozing out of unsealed holes. DON’T PANIC! Just squeeze the edges a little more tightly and everything will be fine, I promise. 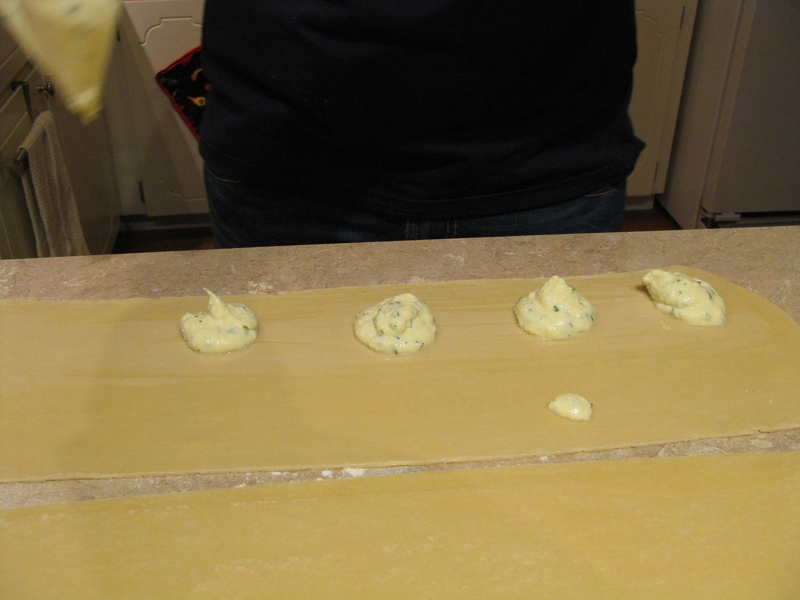 Use a cookie cutter to cut the ravioli into their round shape . When all the ravioli are cut place them into a pot of boiling salted water for 3-4 minutes. Scoop them out with a slotted spoon and into the sauce when they finish boiling. Now put the food on your plate and top with some grated parmesan. Voila! You made a delicious dinner! I made lemon bars out of the Food Network Mag as well but they are terrible in comparison to my tried and true recipe so I’m not even going to post them. Maybe I’ll post my fav lemon bars soon. We had kind of a strange and busy weekend so the chocolate covered cherries never happened. I will make them soon. 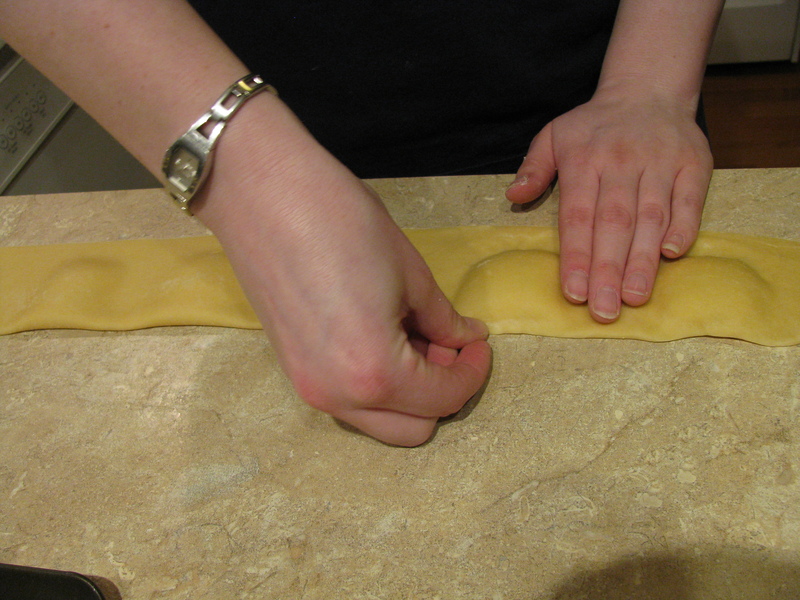 Categories: Cooking, Delectable Dabbling, Food, Savory | Tags: pasta | Permalink. Today we had company for dinner so I made stir fry with a homemade sweet and sour sauce. 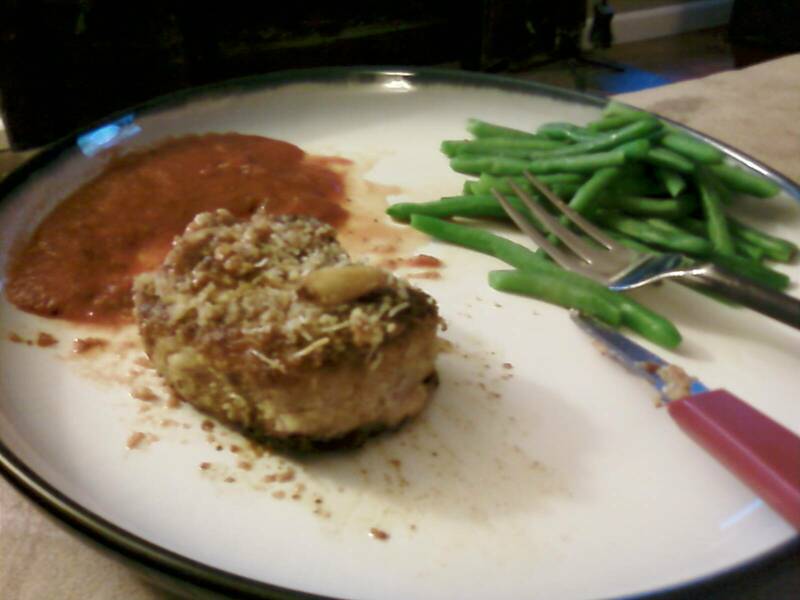 It was very tasty, although next time I will try to add or change some things to spice up the flavors a bit. Kev loved it, though, and that’s what really counts. I also used our rice cooker for the first time. How did we ever live without it?! Fresh rice is so much better than instant and so easy with the rice cooker! For three I used 1 1/2 cups of rice and 2 cups of water. It worked out really well with only a tad bit left over. For the stir fry I use 2 small carrots, one green bell pepper, one red bell pepper, half of one white sweet onion, and one pound of chicken breast tenders, sliced into bite sized pieces. Somehow my brain locked up and I cooked the chicken first, which I wouldn’t recommend. Stick the chicken in a medium hot pan with some oil and the sliced onions and carrots. After the onions are cooked to the desired consistency add the peppers and sweet and sour sauce. Cook all ingredients until sauce begins to thicken. That’s it. Stir fry is super easy! It is a really healthy, simple dinner for those nights when there isn’t a lot of time to put a really big dinner together. My favorite part about stir fry is that you can put any kind of vegetable or meat in it. If you don’t have time to go to the store use whichever veggies you have around. You can use teriyaki sauce, or some other kind of bottled sauce instead of making your own. Get creative! Lemon bars just came out of the oven. I’ll try to get a picture of them-unfortunately we ate too fast to get a picture of the stir fry. 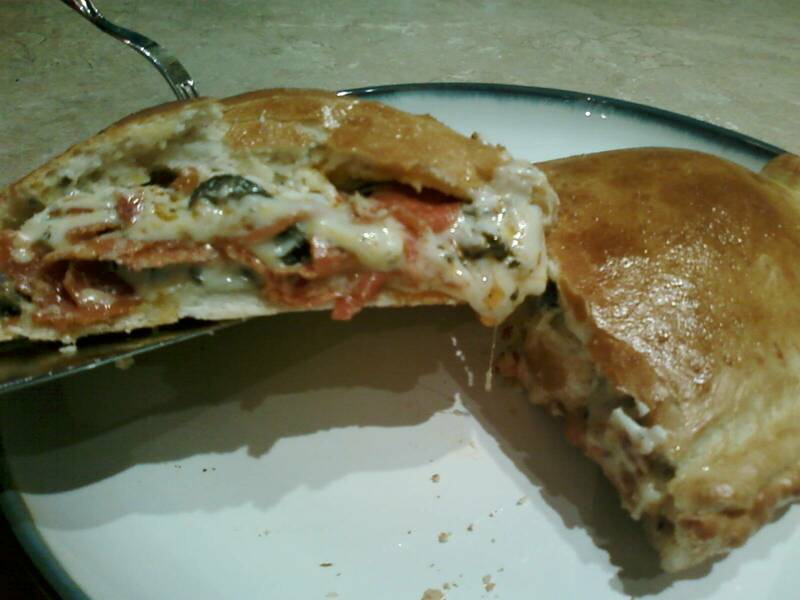 Tonight we dined on homemade pepperoni calzones. They were scrumptious! We would change next time: make 4 small ones (instead of 2 gigantic ones) and freeze 2 to bake at a later date. Despite their massive size they were awesome, and not very hard. They do take a little time, since you have to let the dough rise, but the rest of the prep is real quick and easy. 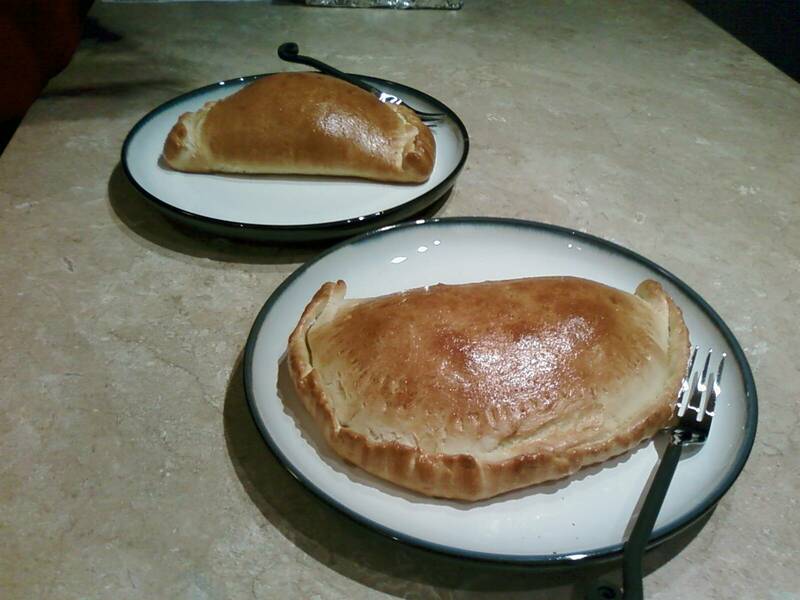 Find the recipe here: http://allrecipes.com/Recipe/Real-Italian-Calzones/Detail.aspx They are much larger than they appear in the picture, trust me. Actually, don’t trust me-see for yourself. Basically to make these you make a kind of pizza dough (yeast, water, salt, olive oil, sugar, and flour) which you knead like crazy for what seems like a lifetime (really only 5 minutes) and fill it with goodness. You could really put anything inside the dough. We strayed a little from the recipe I linked to above. Our goodness: pepperoni, ricotta cheese, mozzarella, black olives, basil, oregano. Mix it all together in a bowl and stick it in the fridge while you wait for your dough to rise. After the dough has about doubled in size, punch it down and break it into 2 or 4 pieces. Roll those pieces on a lightly floured surface until they are kind of circular. Put some of your filling on one half of the circle and fold the dough over the filling. Seal the edges by folding in and pressing down with a fork. Brush the tops with egg (beat one egg) and pop them in the oven @ 375 for about 30 minutes (use a lightly greased cookie sheet, even if it is nonstick). That’s all there is to it! My goal is to make a new dinner and a dessert every weekend. I’m only going to make things I’ve never made before. If any of you have suggestions, fire away! And if you make anything I write about, let me know how it went. Now I’m off to make chocolate chip mint milkshakes (ice cream was on sale for 1.99!). On Saturday I made homemade whoopie pies. The recipe was in the recent Food Network magazine and looked so nummy I just had to try it. It actually wasn’t very hard. Basically just two chocolate cookies with a kind of vanilla frosting between them. Very rich. Very delish. Kev and I have actually had lots of luck with food magazine recipes lately. The first recipe I tried was Perfect Hot Chocolate. To call it a recipe is kind of weird since most of us have probably made homemade hot cocoa at one point. I mean, you put unsweetened cocoa (baking cocoa), sugar, milk in a pan and voila! Cocoa! Of course, this recipe suggested adding bittersweet chocolate (I only had semi-sweet and unsweetened so I put an ounce of each in) which really made it special. Add some cinnamon for Mexican cocoa. Yum. Next we tried hot and crispy chicken wraps. Super tasty, easy, and not really that bad for you, especially if you tweak it a bit. Check out that recipe here http://www.foodandwine.com/recipes/hot-and-crunchy-chicken-cones We do it the easy way, but tweak it even more. We happened to get a mango jabanero salsa as a gift. So here’s what we do to make everything easier, and healthier. Mix about 1/4 cup of the mango salso with about 3 cups of coleslaw mix. 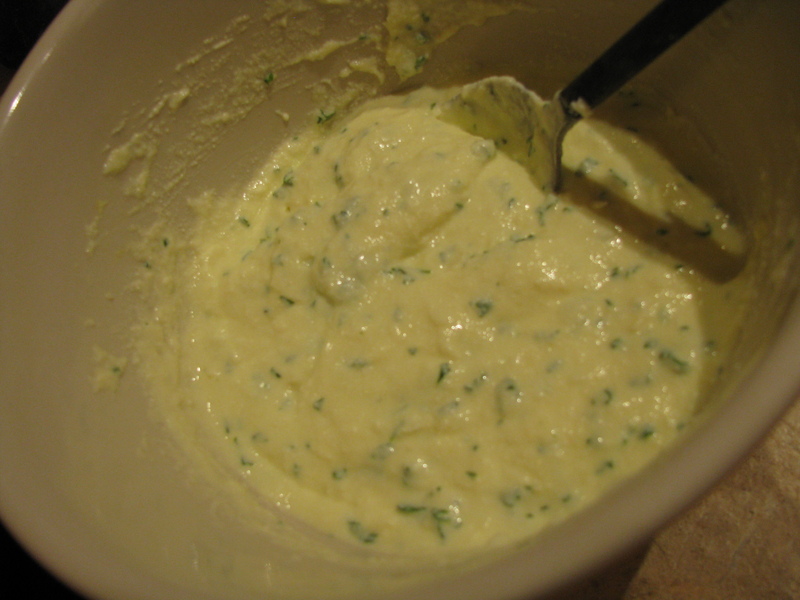 Then mix in 2 Tbsp of mayo. This is your mango jalapeno slaw. For the chicken: purchase chicken breast tenders at the store. For 2 people you really only need 4 tenders for a reasonably sized meal. More than that and you’re going to stuff yourself silly. Wrap the rest of your tenders up for another dish, another day. Now back to cooking the chicken. Put some flour in a shallow bowl. 1/4 cup milk and 2 eggs in another shallow bowl. Wisk them together very well. In a food processer blend about 1.5 cups cornflakes, 2 Tbsp sugar, 1 Tbsp sesame seeds, 1/2 Tbsp crushed red pepper (or red pepper flakes), 1/2 Tbsp salt. Dump the blended contents into a third shallow bowl. Dredge your chicken strips through the flour, shaking off extra flour. Then dunk the chicken into the egg mixture, then roll the chicken in the cornflake mix. Heat about 1/4 inch of vegetable oil in a large skillet on medium heat. Cook the chicken for about 3 minutes on each side in the oil. Place cooked chicken on a rack, or on paper towels so exceess oil can drip off the chicken. Put your slaw and a piece of chicken ina tortilla, wrap it up, and EAT! The best tortillas are found in the refrigerated area (by the cheese) in Fred Meyer. We’ve yet to see them at Safeway. These are the only flour tortillas we have found which do not contain hydrogenated, or partially hydrogenated oils. You will want to cook them before you do the rest of the meal so that it will all get done at the same time. If you end up making any of these things, let me know! It is always interesting to see what other twists people put into their dishes. Categories: Baking, Cooking, Delectable Dabbling, Food, Savory, Sweets | Permalink.